A man is chosen by his world’s creator to undertake a momentous mission to rescue the innocent before an apocalyptic flood cleanses the wicked from the world. So this is a bit of a mixed bag really. It’s not really bad, but its not particularly great either, visuals apart. 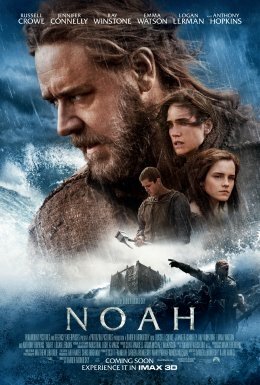 Channelling the spirit of the classic bible epics of the early 60’s (Ben-Hur, The Ten Commandments etc) without getting close to being as good as them, Noah disappointingly manages to becomes less compelling once they get on the ark. It makes several changes from the source material (which have been comically criticised by religious groups, because you know, the original story was obviously grounded in reality!) and initially there’s the makings of a decent story here. Despite the religious trappings, I quite enjoyed the set up with the prophecy and the ‘logic’ behind the need to build the ark, with the depiction of man destroying god’s creation and the need for cleansing. The performances are pretty good, with Russell Crowe making a solid Noah, and Ray Winstone snarling his way through as the villain of the piece. Some of the attempts to give Noah’s children stories doesn’t really work, but there’s an earnestness at work here and whilst not entirely successful, this is a well intentioned effort from Aronofsky. The visuals are pretty great at the point the flood starts to hit, and this sequence is the highlight of the film, which makes it more disappointing that the film’s final act is both absurd and boring. The period spent on the ark is too long, and is held together with a ridiculous ‘conflict’, seemingly invented to make this part of the film more entertaining. It seems strange to criticise storytelling as being absurd in a film featuring rock monsters and a great flood that wipes out mankind, but that’s how I felt about Noah’s character at this point. Overall, there’s aspects to enjoy, particularly the visuals and the strong soundtrack, but Aronofsky fails to master the human conflict at the heart of the story and that makes this a source of frustration more than anything.